CHANNEL ISLANDS HARBOR — Admission is free to this weekend’s Channel Islands Harbor MarinaFest — June 15-16 –which will offer a long list of boating-oriented activities, along with food, live music and fun for the whole family at Channel Islands Harbor Marina. The event runs from 10 a.m.-6 p.m. Saturday and 10 a.m.-4 p.m. Sunday. Attractions include an in-the-water boat display and exhibits on the docks Saturday and Sunday, gourmet food and dessert trucks Saturday at the main entrance, a Saturday open house at the new Boating Instruction and Safety Center, a Father’s Day classic car show on Sunday, a Sunday farmer’s market and numerous boat demonstrations and rides. Channel Islands Yacht Club will host an open house and barbecue, and there will be sailing demonstrations at 11 a.m. and 1 p.m. Saturday and Sunday at MarinaFest. Marine Emporium Landing will present live entertainment and prizes, along with a Scavenger Hunt, cruises from Sunfish Harbor Cruises at 3:30 and 5 p.m. Saturday, a fitness obstacle course presented by Hollywood Beach Fitness from 1-4 p.m. for children under 12, a Hook’s Landing Fishing Derby from 8 a.m.-11 a.m., and Catfish Fry Blues Band from 1-4 p.m.
Whale’s Tail will host a parking lot party with a beer garden and live music from 11 a.m.-6 p.m. Saturday and a Father’s Day Brunch with live music on Sunday. Live steel drum and marimba band music will be performed from 11 a.m.-4 p.m. both days at MarinaFest. Central Coast Electric Boats will offer electric boat rides at 10:30 a.m., 12:30 p.m., 2:30 p.m. both days, and at 4:30 p.m. Saturday only. Channel Islands Kayak Center will offer kayak and standup paddleboard demonstrations and free lessons at 1:30 p.m. both days. 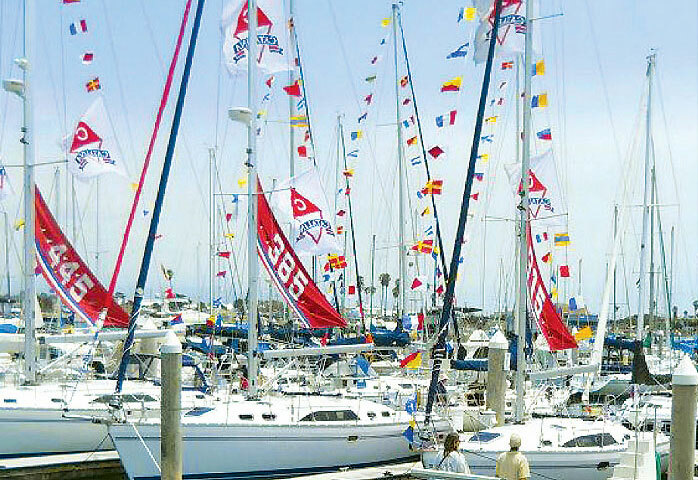 Marina Sailing will offer sailing demos at 11 a.m. and 2 p.m. both days. Pierpont Performance Sailing will host trimaran demo rides every 30 minutes from 11 a.m. to 3 p.m. Saturday and Sunday. Anacapa Yacht Club will host sailing demonstrations for ages 8-16 every hour from 10 a.m.-4 p.m. both days, and Sail Time will give sailing demos at MarinaFest. Onboard marine electronics training and demos — including GPS and chartplotters, radar, AIS, night-vision cameras and more — will be presented by Tom Petersen of Valkyrie Yacht Sales at 11 a.m. and 2 p.m. both days. Sunfish Harbor Cruise will offer a special harbor sightseeing coastal cruise priced at $40 (discounts available for additional passengers and children) leaving at 3:30 p.m. and 5 p.m.
Festival-goers who cruise in will find dock space available for dinghies and electric boats. For guest slip reservations at Channel Islands Harbor Marina, call (805) 984-7780 or visit vintage-marina.com. For more event information, visit CIH-MarinaFest.com.